Let your little ones' imaginations run wild with this vibrant set of magnetic blocks. Let your little ones' imaginations run wild with this vibrant set of magnetic blocks. 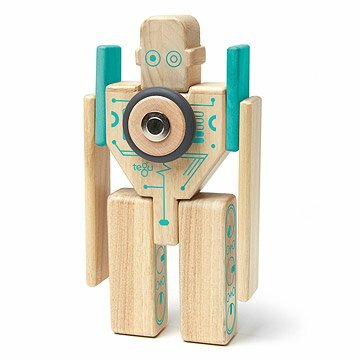 Made from sustainably harvested wood, each block is printed with nuts and bolts to form a charmingly nostalgic robot. Made in Honduras. Keep away from rough surfaces and moisture. Clean with slightly damp cloth if needed. Got it as a gift for a friend and they loved it!! We got this as a gift for our friends 2 year old and they love it!!! This was a gift for my nephew and he absolutely loves it! He just turned one and loves putting the pieces together. This is going to be a gift for my child from Santa Claus. The well made wood pieces are soft and won't splinter and the toy looks just like something that would come out of Santa's workshop up in the North Pole. The elves worked very hard on this toy. Packaging offered examples of different configurations which could be made. Even delighted older brothers. I got this as a gift for my nephew's first birthday. He absolutely loves it. He loves that the blocks click together and I think he'll have fun with this toy for many years to come. My husband and son play with this together. It's durable and gives a great opportunity to for my son to understand how magnets work. It is hard to keep the pieces together, as the box is too large to keep. But all in all it's fun. My young nephew likes to hold the blocks, and his dad loves to help him put this toy together.